Automatic climatic cabinet CATEC DRY240EU EU line equipped with a system adapted to connect the nitrogen that allows for preset humidity level in just a few minutes. Designed to automatically maintain the ultra-low moisture content at 1-5% RH. The cabinet is used for long-term storage of moisture-sensitive components such as ie. Electronic integrated circuits. According to the standard IPC / J-STD-033B electronics should be kept in an environment with a humidity of approx. 5% RH. Automatic climatic cabinet CATEC DRY98EC EC line is a cost effective solution based on aggregate to absorb moisture. Designed to automatically maintain the ultra-low moisture level of 1-10% RH. The cabinet is used for long-term storage of moisture-sensitive components such as ie. Electronic integrated circuits. According to the standard IPC / J-STD-033B electronics should be kept in an environment with a humidity of approx. 5% RH. 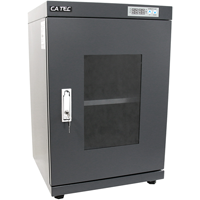 Automatic climatic cabinet CATEC DRY98EU EU line equipped with a system adapted to connect the nitrogen that allows for preset humidity level in just a few minutes. Designed to automatically maintain the ultra-low moisture content at 1-5% RH. The cabinet is used for long-term storage of moisture-sensitive components such as ie. Electronic integrated circuits. According to the standard IPC / J-STD-033B electronics should be kept in an environment with a humidity of approx. 5% RH. Automatic climatic cabinet CATEC DRY98EUD EUD line equipped with a unit for absorption of moisture and the system for connecting the nitrogen to rapidly achieve the desired humidity. Designed to automatically maintain the ultra-low moisture content at 1-5% RH. 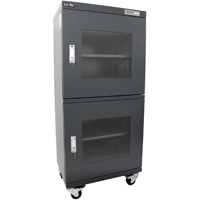 The cabinet is used for long-term storage of moisture-sensitive components such as electronic integrated circuits. According to the standard IPC / J-STD-033B electronics should be kept in an environment with a humidity of approx. 5% RH.